Do you have acne and don’t want to use acne-cure products available on the market as they contain harsh chemicals? Then tea tree oil is an amazing option for you to get rid of pimples. It has inimitable disinfecting and soothing properties, and unlike many other treatments tea tree does not strip off natural oils from your skin causing more damage. Tea tree oil is very effective in treating acne and its symptoms. Read in this article how natural tea tree oil helps in curing pimples and acne just by using some simple tricks. Tea tree oil for skin has ability to cut through dust and grease easily and works as a solvent. When used on pimples, it cuts through the dirt and grime, unblocks the pores by dissolving and removing all the grease, dirt and dust from the skin pores. In this process while its anti-bacterial properties exterminate the bacteria and germs thereby prevent acne breakouts, the antiseptic properties heal the skin. It also has ability to penetrate deep into the skin to unclog the sebaceous glands to sanitize the pores, dry out the pimples / acne and its kinds such as whiteheads, zits, blackheads, etc. and prevent further breakouts. How To Use Tea Tree Oil For Acne And Pimples? 1.Basic Tea Tree Oil Acne Treatment: Apply tea tree oil directly on to the pimples for an effective acne treatment. Make sure if the oil strength is more than 15% then you must dilute it with water first. (i) First clean your skin and pat dry with a soft towel very gently. (ii) Take a cotton swab, bud, pad or tissue and pour a few drops of tea tree oil onto it. Gently dab the tea tree oil on the acne or pimple spots, leaving it on for few hours or for overnight, so as to reduce the redness and swelling. You may feel a little stinging sensation, it’s normal. Repeat this process every day to treat your acne. (i) Use pure tea tree oil but not the products containing tea tree oil. (ii) If the strength of the oil is more than 15%, dilute it first with water. 2. Acne Tea Tree Oil And Aloe Vera Gel Or Honey: If you think undiluted tea tree oil would be a bit harsh or drying on your skin, then use tea tree oil combined with aloe vera gel or honey for multiplied benefits. (i) Just take 1 or 1 ½ teaspoons of aloe vera gel and mix in 2-3 drops of tea tree oil. Aloe vera gel is anti-inflammatory and has soothing effect. Mix it well and apply directly onto the pimples or whole face. Leave it on for few hours or overnight. 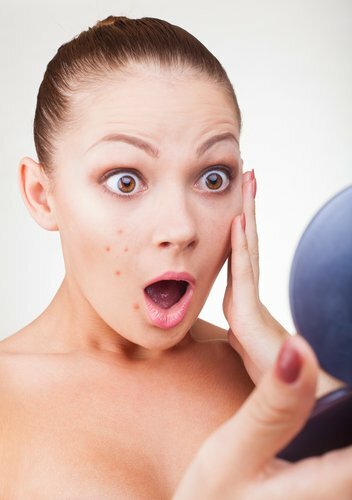 (ii) Wash it off with water and repeat the process regularly to get rid of acne, pimples or zits. (iii) Using raw organic honey instead of aloe vera gel is also an effective acne treatment. Honey also has antibacterial properties and works to heal acne. (iv) If desired, you can apply a good oil-free moisturizer afterwards. (i) Use this tree tea oil for acne treatment instead of pure tea tree oil, if you have sensitive skin. (ii) Consider mixing 2 oz. of aloe vera gel with a teaspoon of tea tree oil in an airtight clean container. Mix it thoroughly and use it for treating your acne and pimple problems. Store the remaining mixture in the airtight container and keep it in a dark, cool place for further use. (i) Tea Tree Oil With Green Clay Powder Face Mask: Add in 3-4 drops of tea tree oil to 2 tablespoons of green clay powder. You can buy this clay at a health food store. Add enough water to make a spreadable paste and stir it thoroughly until you have a smooth paste. Apply the mask evenly on all over your washed and cleaned face and neck. Leave the mask on for at least 20 minutes or until clay dries out completely and let the tea tree oil does its antibacterial magic. Rinse it off with water and pat dry. If you desire, follow up with a good oil-free moisturizer. Use this face mask regularly to remove dirt and acne from your skin. (i) To use this remedy as a spot treatment, reduce the quantity of powder and also the oil accordingly. (ii) Green Clay will soak up all the impurities from your pores, clean them to help reduce your acne agony and cure it. (ii) Jojoba Oil With Tea Tree Oil Face Pack: Take a teaspoon of jojoba oil and mix in thoroughly 3-5 drops of tea tree oil. Add in very finely chopped 1/2 tomato and blend well the three ingredients together to make a smooth puree. Apply this cool face pack directly onto the washed, cleaned face and the skin affected with acne. Let dry out the pack completely for at least 10 minutes. Rinse it off with water and pat dry with a clean soft towel. Repeat applying this mask regularly to get relief from acne and pimples. (iii) Plain Yogurt And Tea Tree Oil Face Pack: Take 1/4 cup of plain, unsweetened, unflavored yogurt. Yogurt has ability to calm irritated skin and decrease redness of the skin. Add in 5 drops of tea tree oil and mix well the two ingredients together. Apply this cool face pack directly onto the washed, cleaned face and the skin affected with acne. Let dry out the pack completely for at least 10 minutes. Rinse it off with water and pat dry with a clean soft towel. Repeat applying this mask regularly to get relief from acne and pimples. 4. Homemade Tea Tree Oil Face Scrub: You can make acne fighting tea tree oil face scrubs at home. Here is a tea tree oil combined with some beneficial natural ingredients homemade scrub recipe. Tea Tree Oil, Sugar, Olive Oil And Honey Scrub: In a small glass bowl mix in well 1/2 cup of sugar, 1/4 cup of olive or sesame oil and 1 tablespoon of honey with 10 drops of tea tree oil. Gently massage onto your cleaned, damp face – using your fingers in circular motions for about 2-3 minutes. Wash it off with lukewarm water and pat dry your face with a clean, soft towel. This scrub may be a bit rough for using on cystic acne, but gives good results when used for mild to medium acne and pimple conditions. The tea tree oil and honey are natural preservatives, so you can store the remaining scrub in an airtight container in a cool, dark place for further regular use. 5. Tea Tree Oil Added Cleanser And Moisturizer: You can add a few drops of tea tree oil to your favorite oil-free cleanser and moisturizer to fight with your acne and pimple agony with full force. Apply 2-6 drops depending upon how strong you want it. Mix it well and apply as you use it regularly. Make sure that it should not get into your eyes. 6. Tea Tree Oil Bath For Acne: Mix in a few drops of tea tree oil to your bath to fight your acne problem on your chest, back and other parts of your body. Perks are that your bath will get a fragrant scent and breathing in tea tree oil infused steam helps to clear congestion, so it’s good when you are having cold. 7. Tea Tree Oil Acne Products: If you find that the pure, essential oil is too strong for your skin, buying a tea tree oil based product is a good alternative. You can find many brands that have channeled the antibacterial and anti-inflammatory properties of tea tree oil in their acne treating products. Some of the acne treatment products such as tea tree oil soaps, cleansers, moisturizers and spot gels are particularly popular. (i) Undiluted tea tree oil when applied directly onto the skin can cause skin irritation, redness, blistering, over drying and itching. Especially, if you have sensitive skin – dilute the tea tree oil with water first. And if your skin is too sensitive, dilute it with aloe vera gel or honey for acne curing effective face mask or paste. (ii) Apply homemade tea tree oil acne treatments on to clean skin. It will give best results when the skin on the top is already clean. (iii) Tea tree oil should be used topically only and not to be swallowed due to its toxicity as it can have side effects. (iv) Tea tree oil is not recommended for children, pregnant women or breast feeding women. (v) Individuals who are prone to allergic rashes, blistering, itching, eczema and other sensitive conditions should avoid using tea tree oil. (vi) You can buy tea tree oil from a health store or through online such as amazon.com. But go for organic, pure tree oil. (vii) Tea tree oil, although effective, takes time to show results depending on your skin type. So don’t be disappointed if you don’t see results in first few weeks, it may take time, but it will definitely show its magic. Enjoy an acne-free beautiful skin! I have heard that tea tree oil is really good for many skin conditions.